One of Austria′s most notable Rococo buildings is Schloss Leopoldskron Castle, a beautiful piece of architecture by the little lake "Leopoldskroner Weiher". It was ordered by Prince Archbishop Leopold Anton Firmian, who also built Schloss Klessheim, in order to accommodate himself and his family. He hired the architect Pater Bernhard Stuart, who was a Benedictine monk from Regensburg in Bavaria and a Professor of Mathematics at Salzburg University. The castle is well-known for its elaborate stucco works, mostly in the chapel and the Festsaal ceremonial hall. They were done by Johann Kleber. Leopoldskron Castle was originally built with three floors and an octagonal tower in the centre. The paintings in the Festsaal hall ("The four seasons") and the chapel were done by Andreas Rensi in 1740. The painting on the ceiling of the chapel was done by Franz Anton Ebner in 1740 and depicts the "Wedding of Atalante". The castle was re-decorated into Classicist style in 1763. In the course of this work, the tower was removed and the third, roof-floor completely re-modelled. After the secularisation and fall of Salzburg in the early 19th century, the Leopoldskron Castle decayed gradually - but rapidly. It sparked only briefly once again in 1848, when Bavaria′s resigned King Ludwig I. lived in Leopoldskron. After the World War I, Max Reinhardt, a co-founder of the Salzburg Festival, purchased Leopoldskron and brought new life to the old castle. He renovated the building and used it for some of his stage productions as well as for many social events like receptions and balls in the course of the Festival. In the early years of the Salzburg Festival, Leopoldskron Castle was a central point and the history of the festival is tightly linked with the history of the castle. However, Reinhardt′s initial intention was to buy a property in Switzerland instead of Leopoldskron. It was his second wife, Helene Thimig, who convinced him of Salzburg and the castle. In the early 1930ies, when Leopoldskron was the central spot of the social life around the Salzburg Festival, Winston Churchill visited Reinhardt and the castle. The story goes that Churchill enjoyed the evening and the dinner sufficiently enough to ask for the recipe of the duck they have had that night. With the incorporation of Austria into the Third Reich, the Salzburg Festival decayed temporarily and the Jew Max Reinhardt had to leave Austria in 1938. Today, you can stroll around the area of the Leopoldskroner Weiher lake and mingle with locals walking their dogs or watching birds. 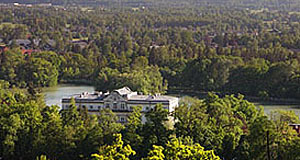 The Leopoldskron Castle itself is not open to the public, it is owned by the Salzburg Seminar (an organisation founded by Harvard Graduates after WWII) and private property, but partly used as a hotel.